If you’re interested, all you have to do is download the free LendingRobot Dashboard app and sign in to your accounts. A fantastic perk is that you don’t have to actually sign up for LendingRobot’s own service. It’s a great way to monitor your portfolios without having to create a new account and pay for an additional service. LendingRobot Dashboard, the new app, incorporates much of the genius of the service. For instance, you can check on your “overall health,” which shows you the value of the loans in your portfolio across the three aforementioned marketplaces, plus the current return percentage, average interest rate and more information. Essentially, it’s a convenient place to see how well your investments are doing and the overall state of the marketplaces without having to check each one individually. The app even features a handy, visual mosaic chart with the value and returns by account or grade. You may have seen LendingRobot in the news because its a pretty important product in its own right. Because investors tend to spread out their investments across a wide range of loans to reduce risk, managing all of these investments is a daunting task to say the least. So LendingRobot automates this whole process by using its algorithms to automatically make intelligent investments based on rules you set, then lets you sit back and view your portfolios and cash out whenever you want. LendingRobot managed to raise $700,000 in seed funding plus an impressive $3 million in series A from Runa Capital. It’s still a company with just seven employees, but reception to the automated investing has been positive. Investors ought to have one more field day with the LendingRobot Dashboard app. 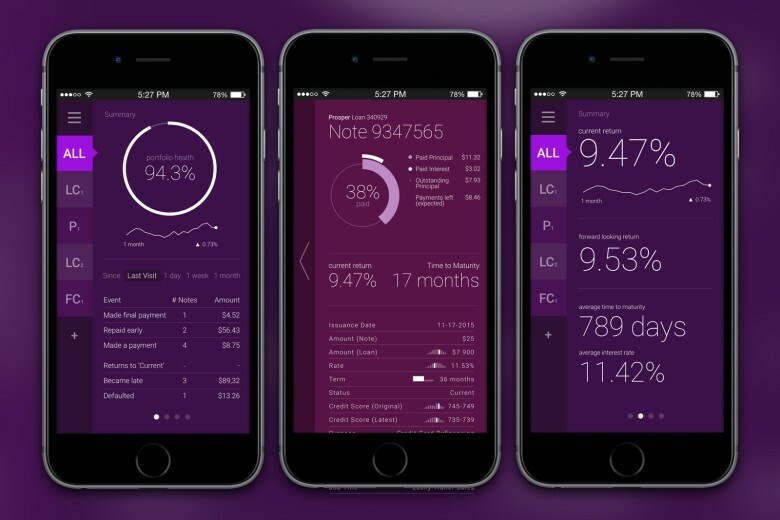 You can get the LendingRobot Dashboard app free for iOS and Android now. Again, you don’t need to sign up for LendingRobot’s service. All you need to use the app is an account with LendingClub, Prosper or Funding Circle.